You've run into an issue with your Internet connection and you're sure your modem hasn't gone on the Fritz?! 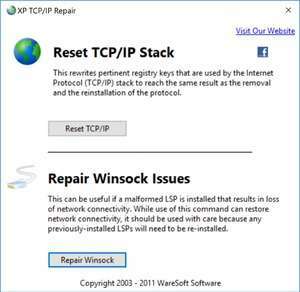 You may want to run XP TCP/IP repair which will restore your connection to normal values. This program eliminates the requirement of command line controls to repair or renew your network connection. It offers all of its features through an unintrusive and simple user interface that virtually anybody should be able to use. For security reasons, you should also check out the XP TCP/IP Repair download at LO4D.com which includes virus and malware tests. Additional screenshots of this application download may be available, too.